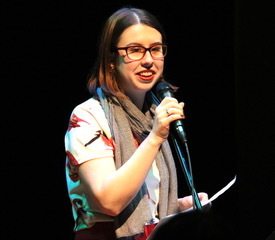 A warm welcome indeed was provided by comedian Sarah Fearon who hosted the first half of the salon with her singular wit and charm. M.C. 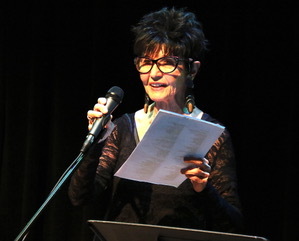 Neuda, veering from her usual crime fiction mode, led off with a piece of literary fiction entitled “Tess in the Master Class,” which tells the tale of a singer seeking attention in a master class presided over by a world-famous opera singer, only to find that recognition is a double-edged sword. No happy ending here, but, as usual, an affecting reading by Neuda. 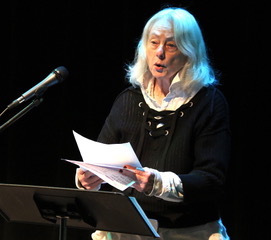 Visual artist, poet and translator Vivian O’Shaughnessy presented the poem/monologue “Us,” an imaginary love-chat, via phone messages, of James and Nora Joyce. 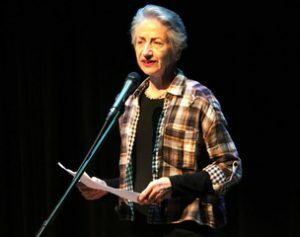 Among her creative projects, Vivian has produced an ongoing sketch history of performances at the Cell Theatre, where she is a resident artist. Playwright Dan Brown presented an excerpt from an original play in development entitled Melrose. 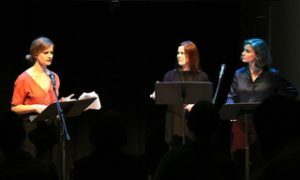 The scene, read by actors Jamie Lee Kearns, Rebekah Madebach and Stephanie Fribourg, takes place in a yoga studio where three women embark on a lively discussion which involves a man with one ball and a cat with three legs. After an intermission for drinks and socializing, the salon resumed with the able and affable Miranda Stinson taking over as emcee and introducing frequent presenter, John McDonagh. A talk about what life was like bartending in a Bronx neighborhood bar during the Bronx “crack wars” might sound grim, but not when delivered by the very entertaining Mr. McDonagh, who as usual had his audience in stitches. 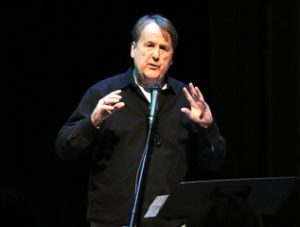 He will be performing, with Malachy McCourt, an “Atheist Christmas” fundraiser for radio station WBAI, at the Brooklyn Commons, 388 Atlantic Ave, Dec. 9th, 3 – 5 p.m. For further information please visit John’s website. Hell hath no fury . 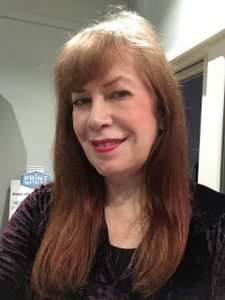 . . and Obie winner Rosina Fernhoff proved it with another stellar performance, delivering a spirited interpretation of “Vengeance” by Joseph De Luise. 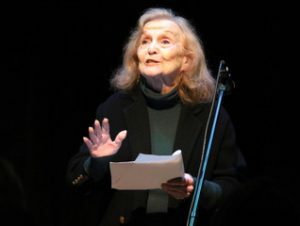 The monologue, in the form of a diary entry, builds to a tirade as a woman recounts her unsuccessful attempt to attract a man she encountered at a Senior center who remains exasperatingly oblivious to her allure. Another first-time presenter, Patricia Carragon, shared a poem entitled “In Dreams” which appears in the fall issue of Muddy River Review. Inspired by a Roy Orbison song, the poem is a response to the “Me Too” movement. 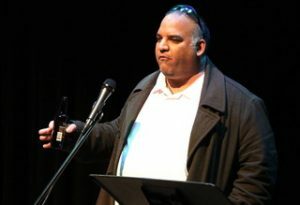 Carragon is host of Brooklyn-based Brownstone Poets and editor-in-chief of its annual anthology. 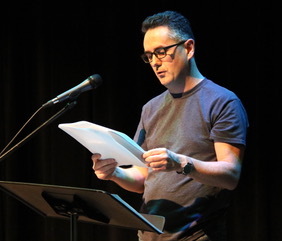 Yet another first-timer, J. Eric Castro, a fiction writer from Staten Island, also found the audience warmly welcoming not only of his Irish 11% (verified by his mother’s DNA test) but of the other 89% as well. He read a poem entitled “Psalm151: Of God and Prozac,” which emanated from a challenging time in his life when he questioned life, the universe and everything in between. 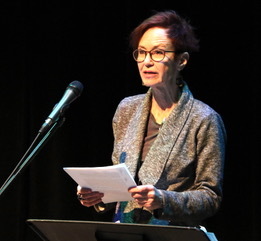 Poet Natalie H. Rogers offered two poems entitled “I Refuse to Die Like an Old Person” and “On the Other Side of Over the Hill.” Her vibrant presentation ranged from poignant to defiant, and assured all present that entering old age does not mean the end of fun. 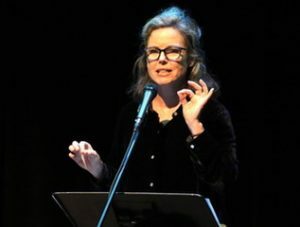 A psychotherapist, Rogers runs a clinic for public speaking called Talkpower and has published several books on the topic. 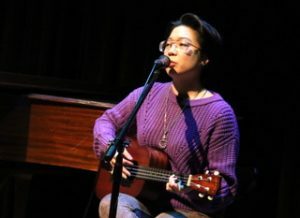 The evening was brought to a close by singer/songwriter and accomplished musician Adrianna Mateo, who accompanied herself on ukulele for “Autumn Sun,” and on piano for “Skin Hunger.” Both of these compositions were honed at our salons and it was delightful to see and hear the blossoming of both the songs and the singer. Till next time, Tuesday, December 4th, 7PM at Thalia Studio at Symphony Space.